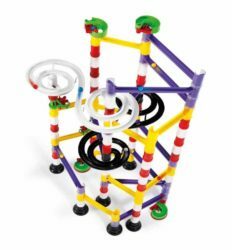 Create your own marble runs with this exciting Quercetti Elevator Marble Run construction set. Reproduce the models pictured on the box or enjoy experimenting with your own designs. Interlocking chutes, bridges, columns, spinning-wheels, spirals and funnels can be combined in infinite variations for long-lasting fun. This toy stimulates creativity and reasoning both of which are required to build impressive-looking structures with the correct angles of inclination. With the exciting elevator you can create endless cascades of marbles with mesmerizing visual effect.